If you don’t already know, Bone Broth is one of the number one foods you should be eating (drinking) while trying to conceive. Actually, no matter who you are in what walk of life you are in, you should probably be drinking bone broth. I struggle with multiple infertility diagnoses and I believe that daily bone broth helped me have my second miracle! 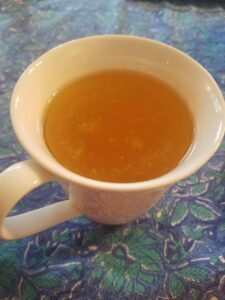 The mainstream uses of bone broth are plentiful- helping leaky gut syndrome, or other gut issues like Irritable Bowel Syndrome, managing or even overcoming food allergies and intolerance, giving your immune system a boost, and helping with conditions like arthritis that are joint related. But here’s what you might not know- bone broth is amazing for fertility! 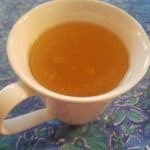 Whether you have just started, have been trying for a while, or are struggling with a diagnosis of infertility, you NEED to be drinking bone broth, preferably every day. Also, you should really, really be making your own and not buying it from the store. You need to use organic bones too, grass-fed, organic if you can find them. Bone broth is made from meat bones simmered for days with vinegar to leach out the goodness. You get plenty of amino acids and collagen which helps to heal gut and digestive issues. Gut and digestive issues are directly linked to many hormonal and fertility problems. As your gut heals, your gut is then able to actually process the vitamins and nutrients you are eating in your super clean, high protein, high fat, low carb evidence-based fertility diet. Thus, you are able to actually fully nourish yourself. Bone broth is packed with amino acids, calcium, and other nutrients that help balance your hormones and make you more fertile. Bone broth nourishes your kidneys, and so Traditional Chinese Medicine (TCM aka your acupuncturist) love it for helping to replenish Kidney Jing which can be found in bone marrow. Jing is what your eggs are made of according to acupuncture. There aren’t made substances that include Jing energy, so drink your bone broth every day. Bone broth has 0 carbs and 15 grams of protein making it a perfect addition to your evidence-based fertility diet. This really helps when you are trying to hit your Protein/Fats/Carbs ratios that are ideal for fertility! Convinced? The recipe is painfully simple. 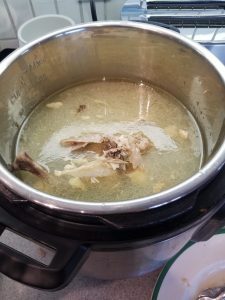 You can make it with any kind of organic bones you purchase, but to be efficient and cost-effective, we always make ours with the leftover skin and bones from our weekly roast organic chicken that we make in our Instant Pot. You can roast yours in the oven, but the Instant Pot makes things fast, doesn’t heat up your kitchen, and you can totally walk away from it (no checking and basting every 20 minutes required. The BEST thing about the Instant Pot is that it is also a SLOW COOKER. You can do everything in this contraption. AND it is totally non-toxic- made from high-quality stainless steel. We’ve actually stopped using our crock-pots due to concerns with the ceramic. Get your Instant Pot and you can gift your crockpot or just keep it for parties! So, we roast a whole organic chicken, pick it clean and save the meat for our weekly meals, and then put the bones and skin back into the Instant Pot. Add in some water and a little apple cider vinegar and switch it over to slow cooker mode for 24-48 hours. Boom! Bone broth. Of course, if you want to you can add all sorts of veggies and seasonings before slow cooking. Bones and skin are ready to be made into bone broth! AND you don’t have to clean the thing in between roasting and making your bone broth. If you have to do everything in the stove and then move to the slow cooker you have way more clean up. Also, with the InstantPot you don’t smell the bone broth cooking like you do with a slow cooker or crock pot. Although I loved the smell- it drove my husband crazy (in a bad way). So he loves the Instant Pot too! If you don’t want the full 8 qt Instant Pot or you are looking to save a buck, you can definitely fit a small-medium organic chicken in a 6 qt Instant Pot! We own both sizes because we are crazy addicted to this contraption. 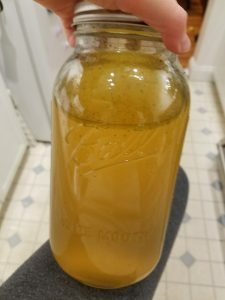 A full mason jar of fertility bone broth! Want to make your Bone Broth fancier? You can make this as fancy or as simple as you like. We keep it super simple and efficient. We’re after all that goodness leached from the bones, and we don’t want to put in a bunch of veggies and herbs that are just going to take a bunch of time to chop and then be strained out. Of course, their goodness will be leached into the water, so if you have the time and are inclined, add some yummy nutritious stuff! I’ve seen recipes that include ginger, fennel, swiss chard, lemongrass, astragulus, reishi mushroom powder, etc. Basic items that I add when I can include: onions, garlic, and ginger. Yum! Time to relax an enjoy this nourishing fertility beverage! Alright, without further adieu, here is the recipe! Are you ready to discover YOUR perfect fertility diet? Tired of all the conflicting fertility diet information? It is up to YOU to take control of your fertility journey and do the research to figure out YOUR perfect fertility diet. I've developed this free e-book as a guide to jumpstart the process. It includes tailored diet information for many infertility diagnoses, such as PCOS, Endometriosis, Anovulation, Luteal Phase Defect, Thyroid Problems, Fibroids, Unexplained Infertility, and more! It is completely free to download! Enjoy! Success! Now check your email to confirm your subscription. If you don't see an email in ten minutes or so, check your spam folder! Yes, I'm ready & I love free! A super easy chicken bone broth for gut health, wellness, and fertility. I make it in the Instant Pot on the slow cooker setting, but it can be made in any slow cooker or crockpot! Any extra veggies you want- onions, garlic, celery. Any extra herbs you want- rosemary, thyme, bay, etc. Put the bones, skin, neck, and any veggies and herbs you desire into the Instant Pot or your favorite slow cooker/crockpot. Cover completely with filtered water. Don’t go above the fill line of your Instant Pot. Press the Slow Cook setting on your Instant Pot. Slow cook for 18-48 hours. The Instant Pot only goes up to 24 hours, so you have to reset at that time if you want to slow cook for longer. Strain the liquid (we use these stainless steel mesh strainers) and save it in a non-toxic heat safe container like a large 64 oz size mason jar. Drink a big mugful every day, and store in the fridge! You’ve got what you need at 18 hours, the flavor just becomes more rich and intense as you cook. We usually pull it at 24 hours unless we are too busy, then we let it keep going for 48! You can Pressure cook for 1-2 hours if you are in a hurry. But, I think there is something special about slow cooking bone broth. You can make this with beef or fish bones as well! You can really have fun with added veggies and spices, or you can keep it fast and simple. Up to you! YES, you should heat up, melt, and drink that fatty collagen layer on the top. If you don’t want to, you can take it off with a spoon and use it as a fat for cooking! « 79 Diet and Lifestyle Changes I Made to get Happy, Healthy, & Pregnant! I don’t have an instant pot. Will I get the same results from a crock pot? And if so, how long should I cook it in the crock pot (on low or high)? Thanks! Yes, you will! Recipe is the same for a slow cooker/crock pot because we just use the slow cooker setting on the Instant Pot! Low for 24-48 hours! Heeeyyy Tania!! I’m so glad you love it!!! We do the same thing, dump it all back in!! Keep on enjoying it! How essential is it that I be making the bone broth myself, and why? Thanks! I always think home cooked is the best, but here’s what to look for– if you can find pre-made bone broth that is packaged in GLASS not plastic or a tetra box, AND has the gelatin layer (basically looks like a fat layer when chilled in the fridge), then its good. You need an artisanal bone broth usually, not a big brand to find this. I think EPIC makes nice ones (I’ve heard from other bloggers), but I’ve never tried it myself! I guess I will this week, and if I like it I can share with my readers! Hi Anna, if this recipe makes only 1 cup and you recommend drinking 1 mugful (it’s 1 cup right?) per day, then do I just add bones of 3 chickens to make 3 days worth of broth? Serving size is 1 cup, but this makes 12 servings!!! I love drinking bone broth! It’s reduced my osteoarthritis and overall pain a good deal. Additionally, I used to be more sensitive to specific foods. I believe that the bone broth has legitimately helped my digestion within this area. bone broth into my diet. How do you feel about drinking bone broth with a collagen capsule for enhanced health benefits? I’m so glad bone broth has helped you in so many areas!!! Adding a collagen capsule or powder seems a bit excessive since you should already have the natural collagen in the bone broth- why not put the capsule/powder in your smoothie instead, or consume it some other time of the day? But I can’t imagine it would hurt! I love this recipe! At first I thought this would taste disgusting but it ended up being so good! And I’m even enjoying the taste! I LOVE your blog!! So grateful to have found it! YAY!! I’m so glad you wound up loving the taste! What an added blessing!!!! I’ve read a lot of reports that say using a pressure cooker is healthier than using a slow Cooker since the pressure cooker retains more nutrients in the food. Fatima, Fascinating! I also just a read a report that there are toxins in the ceramic in slow cookers :(. Another reason to use a nice high quality stainless pressure cooker like the Instant Pot! Hi! At what time is this better to drink? With food or no food? Do we heat up before drinking? Hi! New to all this, so I was wondering if I had to sip bone broth like a drink or can i incorporate it into some kind of soup? haha, i am nervous about the taste.